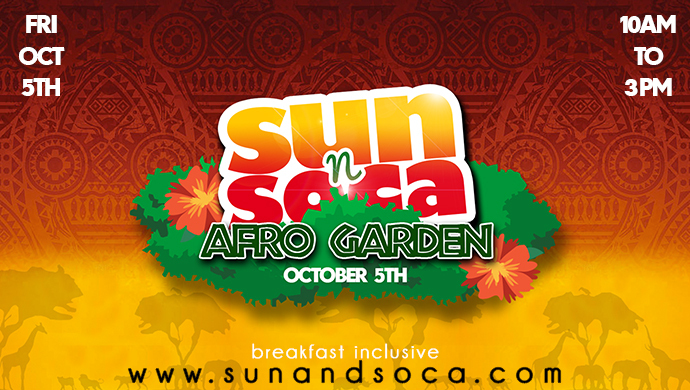 Sun N Soca Has Always Been About The Fusion Of The Soca Vibes & The Afro Riddims Of Our Homeland. This Year We Take Our Journey To The Gates Of The Afro Garden! Experience A Unique Musical And Visual Presentation Featuring A Strictly Soca & Afrobeat Entertainment Lineup! Dress Code: Afro Chic, Summer Wear - Shirt Required - Get Creative ! This Is A Ticket Only Event. Limited Tickets Are Available.